Sunday we'd meet at Linton grange engen at 7am. 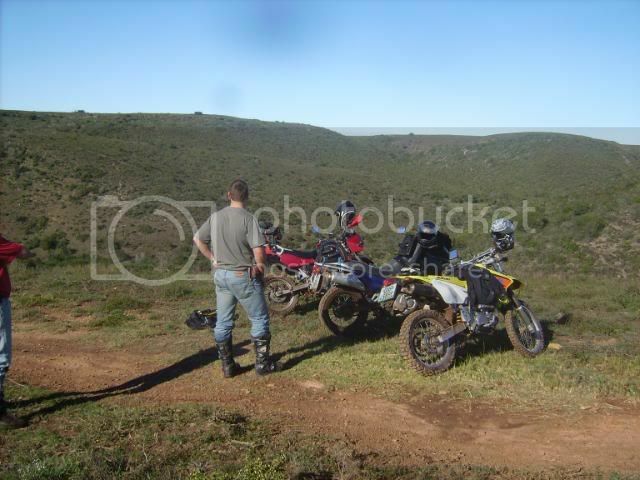 Then of to elandsrivier, longmore forest ending with a jol at Jagtesvlakte. Phone jMan and tell then to go ahead, I'll catch up. After jump starting from car and other Sh$#%t I head out in a rush up Elandsrivier. The road is OK after the weeks rain with only a few slightly slippery spots. 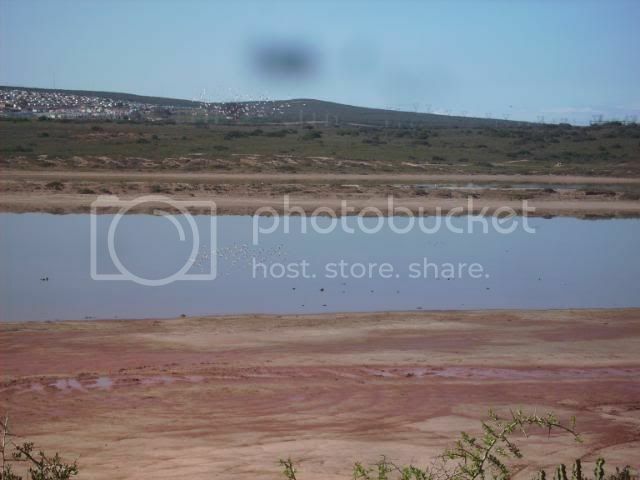 But I'm focusing on the road ahead too much and miss the turn to Longmore. Get an SMS they're heading back. I turn around and meet JMan and Tier back at Uncle Freddies. The others have gone home. Sakkies starter would'nt work suddenly so he never came wish. So We follow Jman into the bush. The first section is a path along a stream. Jman rides ahead flattening the rocks with his bash plate. 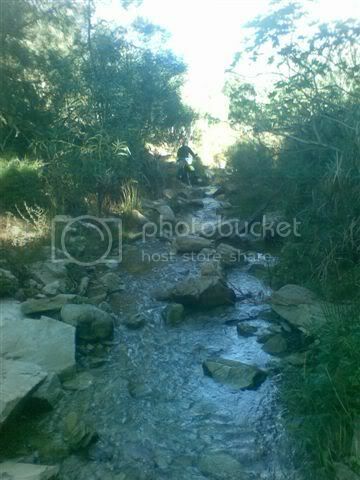 definitely going to have a father and son ride / hike and braai along here soon. I promise myself this every time I come out to this area. We got to the spot where Jman and mates turned around last time. But as we had the protection of the Tier from Patensie we were safe to continue. here he is empting his boots while Action Jman saws down the odd tree in our way. next time jman leads the ride, bring a chain saw. His disadvantage with low clearance over the rocks sure helped him under the branches. The KLR couldn't fit under a few places making hard work of keeping up. Finally we see a bit of sky again and turn left up a hill. Jman led the way again but decided to stop 3/4 way up to ensure we made it OK. Tier stopped next to him to chat about it. Then a guy & his babe (that's what he called her) came up and stopped. 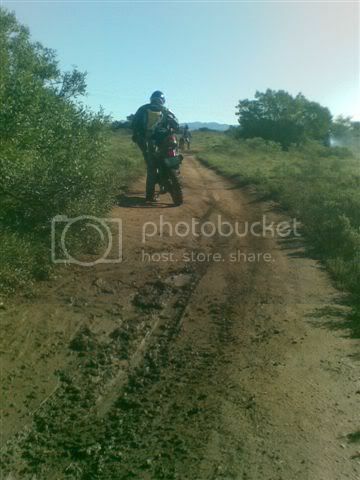 He gave us directions to the vlei and then rode off, stopping ahead to wait for us. After more directions I shot off ahead feeling like getting to 3rd /4th gear for a change. I come around the bend and there's just mud ahead. I slow down a bit wanting to maybe go right but see the DR400 catching up on the right. Straight down in the mud. 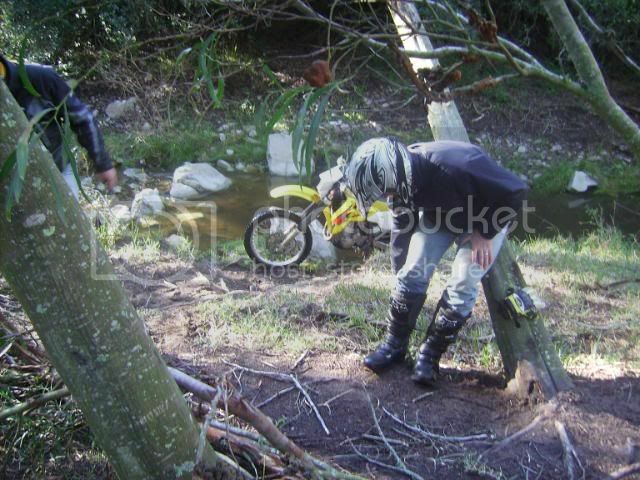 I actually slid a few meters with the bike in the mud, to everyone's enjoyment. Now on the BM training course they say you don't pick your own bike up after a fall, but these okes haven't had any training. They're just trying to get their cameras out. Luckily they haven't practiced the fast draw yet either. I tried picking the KLR up but the mud was so slippery, it just slid slowly to the edge of the mud before it would start rising. Then we followed the power lines down the hill and valley, turn left and headed for jagtesvalkte. 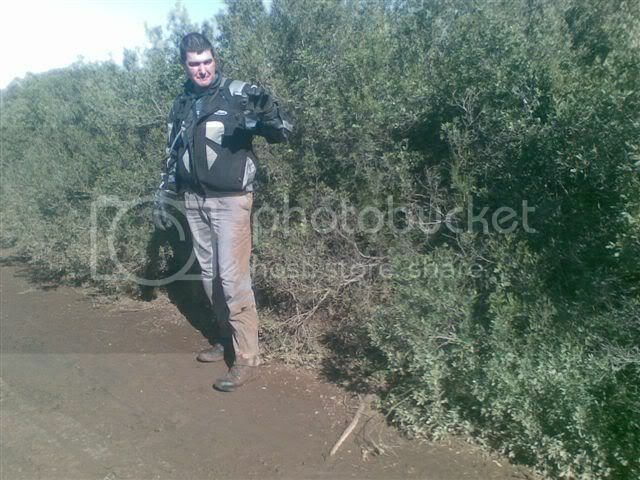 It was great fun mixed with a few hairy moments of mud and taking the wrong options across the sloots and dongas. On more than one occasion I ended up at 90° to the path I was on, having to try and back up in the mud while my friendly mates caught up and smiled at me. We rode around the area and then started back reluctantly. Suddenly I notice my GPS has fallen off..
We start back tracking without much hope as we'd ridden a fair bit off the tracks as well. I start thinking I'd seen it on at jagtes but not too sure. 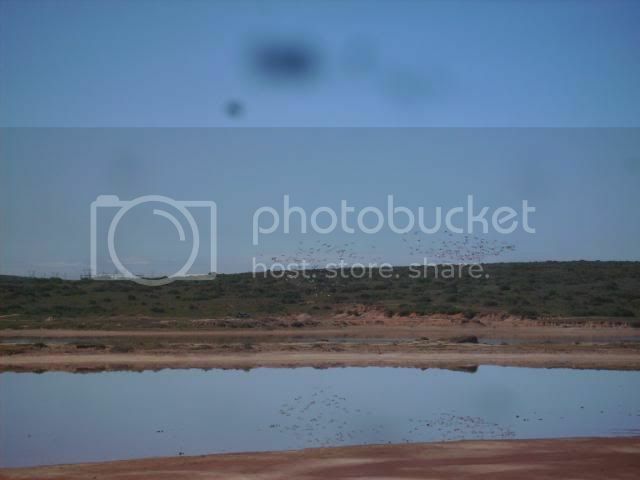 can't see how it could have bounced off. we wern't riding as hard as I had in the past with it on. We stop and check photos. The last place it is on the bike is before the fall. We decide to go straight up the hill as it's shorter. The dongas are a bit bigger than the last time I rode up, but luckily there's been a slight improvement in my skill as I managed without stalling or falling or stopping. 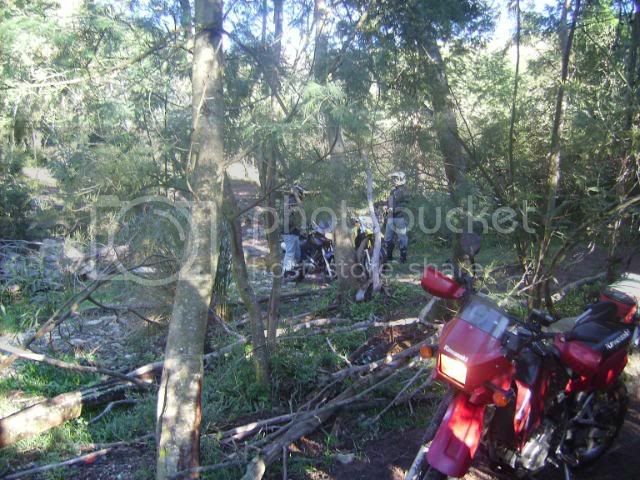 We head back to the spot and looking in the bush next to the rode Jman finds the GPS. A bit muddied and scratched but still working. Then off the out of Africa for the obligatory after ride beer, and rush home. I had a jol out there. 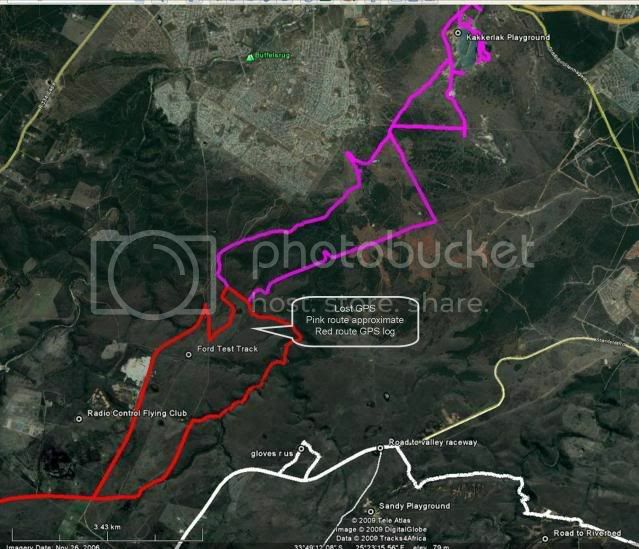 Nice thump, ja actually the plan was to go into longmore from elands side, and then bit of tech riding in ford test ground. 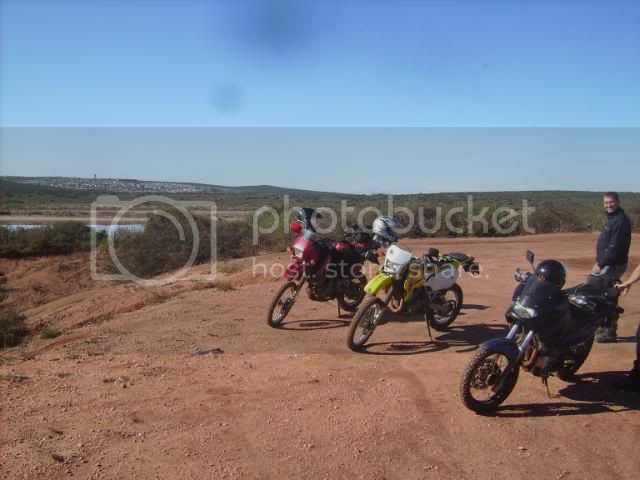 Dawi got spuit poep, Amasakkie's starter packed up, so it was just Tier, Tiaan, Conway and me going the first road to elands. 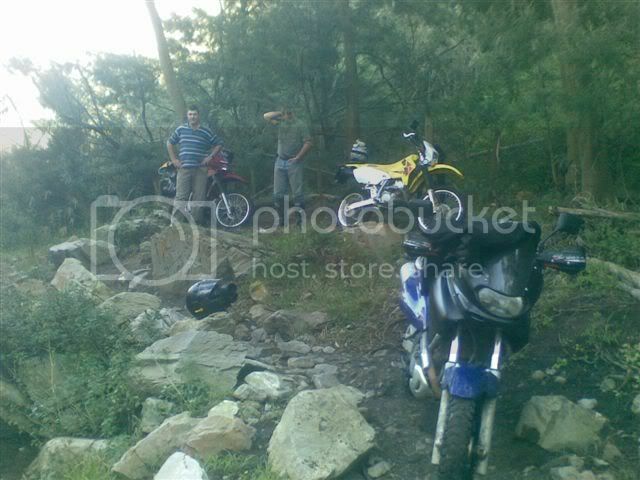 Conway's bike did not make it up the wet incline with the road tires, and Tiaan on his 250 ching chong chinaman bike(lekker bikie), had to get home before 9 to a appointment he forgot about. And then thumps slipery ride began. Tier is my cousin from Patensie, he acually came with his wife to a dance we went to, and when I told him about the ride, the bike was on the bakkie. 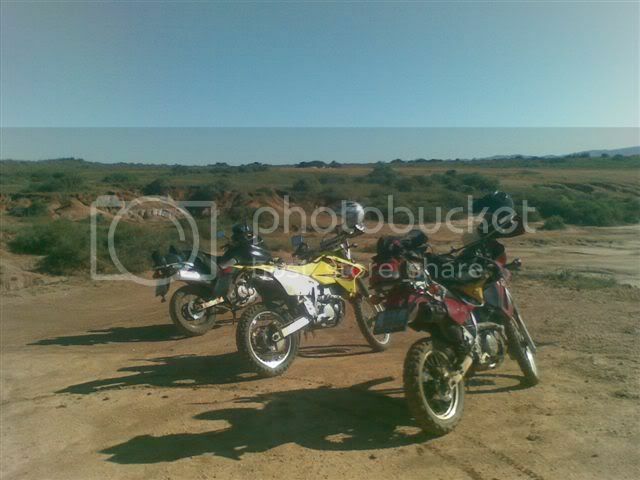 Thanks thump and tier, was lekker ride, and Tiaan and conway for the first part. Thanks mamba, I think it was a bit stupid to take my bike there, it's much lower thant the other two, wanted to turn around a couple of times, but there was not realy a lot of space to turn around in, was fun in anyhow, enjoyed it very much. The Road got smaller and smaller until Jman got a little scared..
Ai Jman spin jy alweer?